The ‘Here and There’ art walk is to take place in the Belper Parks wood during the weekend of May 23rd to May 25th. 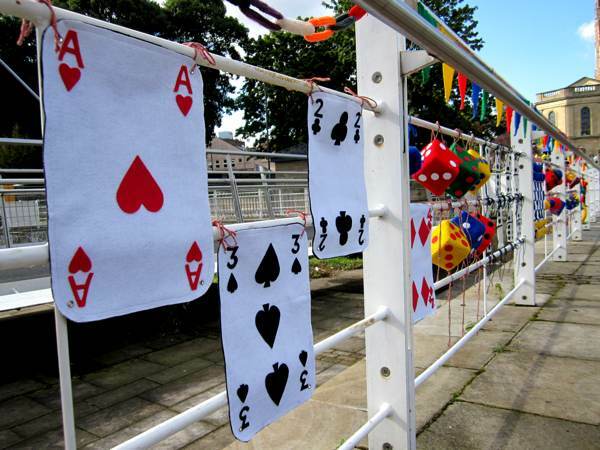 Artists who would like to take part can find out how to apply on the Corridor Arts website. I am writing this blog to encourage knitters, crocheters and textile artists to make pieces of work inspired by nature. These will be exhibited as part of the ‘Here and There’ art walk. May 15-24th 2015 is Voluntary Arts week. 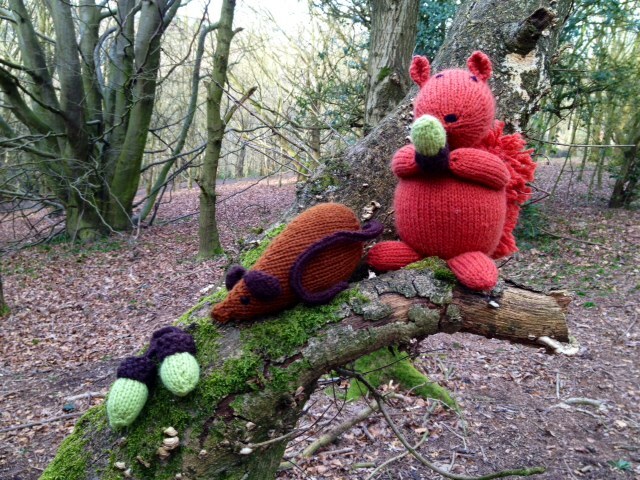 During this week woods all over the country will be decorated with woollen creatures and vegetation as part of the Woollen Woods. 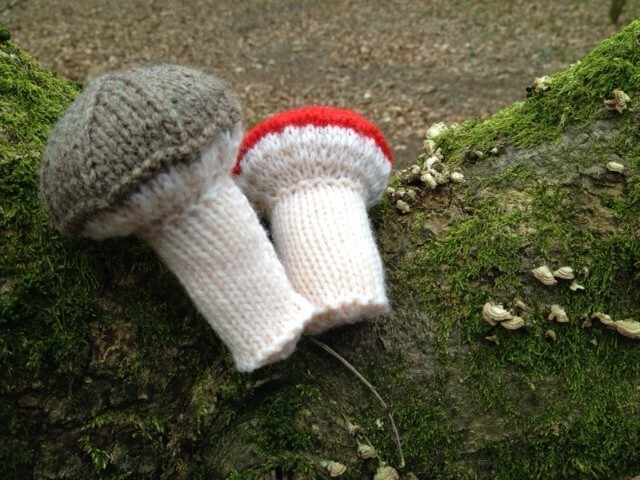 The part of the art walk weekend that I am involved with is ‘Here and There’, inspired by the Woollen Woods. The plan is to get as many people as possible to make items to decorate the woods. 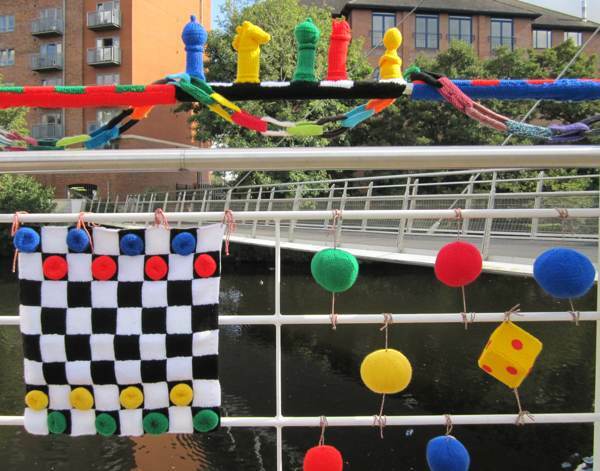 In 2012 I organised a yarn bomb inspired by the Olympics as part of Derby Feste. 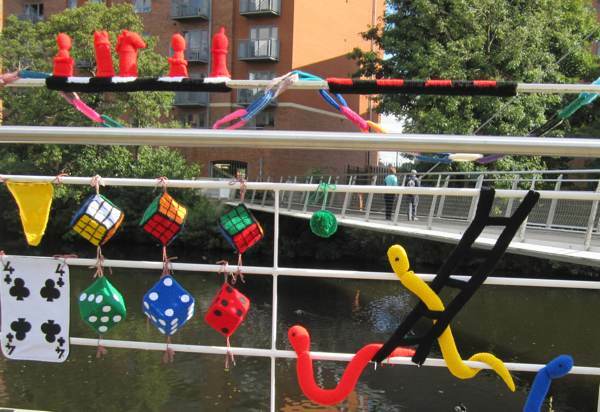 Knitters, crocheters and textile artists from Derbyshire made pieces on the theme of games which were displayed along the railings of Cathedral Green. Everyone who took part really enjoyed the experience. It allowed people to be part of an art installation who would not usually have this sort of experience. There are lots free knitting patterns available online on sites such as Knitting Pattern Central and the UK Hand Knitting Association site. It is a fantastic way of using up all the small amounts of wool left over from other projects. 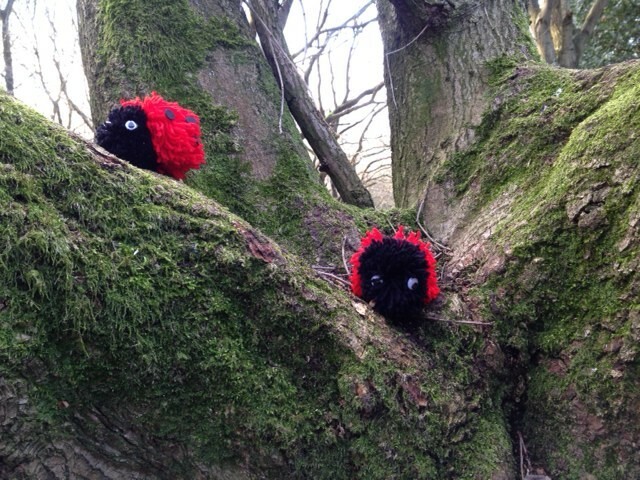 I have encouraged my grandchildren to take part and they are making some pom pom ladybirds. 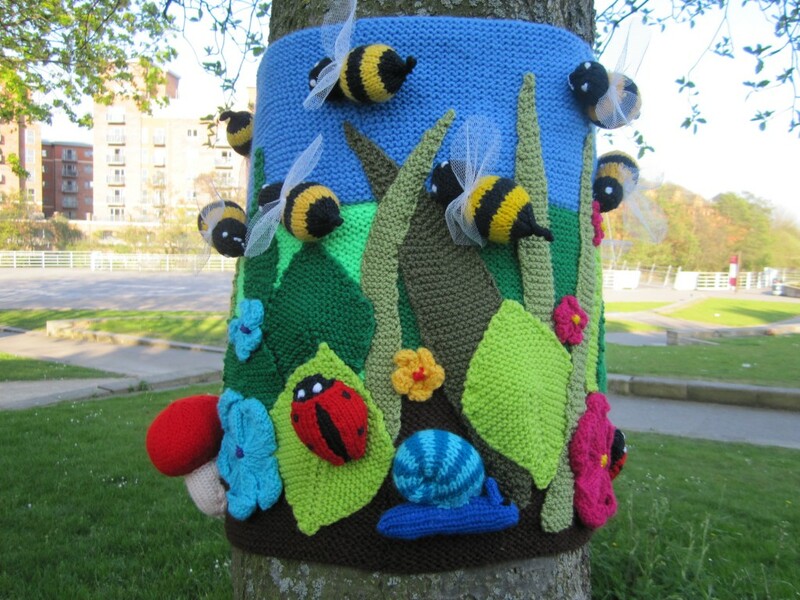 The area of Belper where the ‘Here and There’ art walk is to take place is called The Parks. It is an ancient deer park going back to the 13th Century. It is still possible to see parts of the walls that kept the deer in place and the holly that fed the deer. In the past the woods were home to red squirrels and for the weekend in May there will be red squirrels back in the oak trees. There will be bees and dragonflies. Leaves, flowers, snails and butterflies. 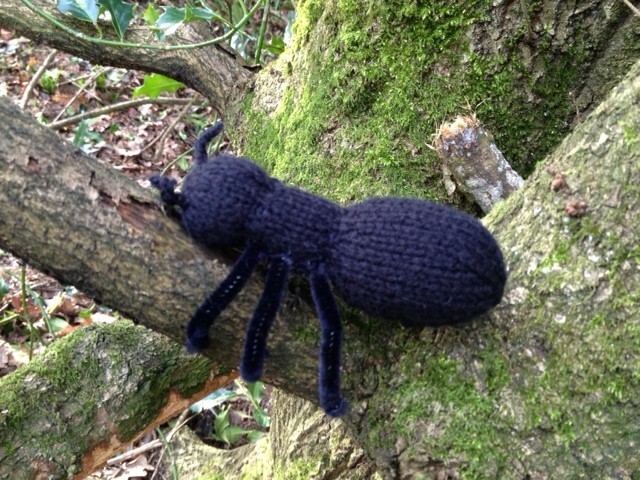 I hope there will be lots more creatures and plants that will make the woods alive with wildlife during the bank holiday weekend in May from Saturday 23rd to Monday 25th. If you can help please contact me by email anneclark.co@gmail.com or leave a comment on this blog. The work will be up for a short period of time but there are plans being made for it to move to another location in Belper. I will need the all the creatures and vegetation to be sent to me by May 10th. 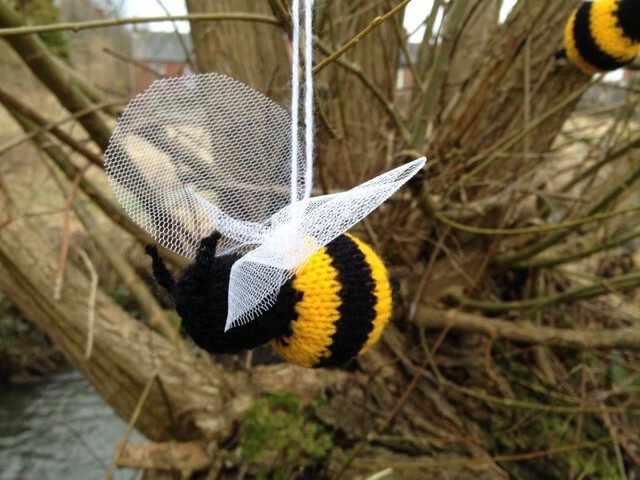 I can be contacted by email, phone or facebook page for the address..
Posted on March 9, 2015 March 12, 2015 Author Anne ClarkCategories Days Out, Making, NatureTags Belper art walk, Belper Parks, here and there, Woollen woods. I would love to be involved in making some things for this. That’s great Jane, please make anything you like that fits in with a woodland or natural theme. I will send you an email with my address. Hi Della, it’s great that you would like to join in. Don’t worry about size, I have been given badgers that are 2 inches long and snails that are 12 inches. The important thing is to knit or crochet something you enjoy making. I will send you an email as well as this comment. just heard you on the radio (sounds fantastic – well done) and put dates in my diary. 1. I live in Darley Abbey and have designed mr5adayuk – he is a role model and i have just started marketing him. His main aim is to get everyone eating their fruit and vegetables, get healthy and save the NHS billions of pounds as a lot of health problems are connected to lack of vitamins, minerals and trace minerals which are found in fruit and veg. 2. For the activities/demonstrations in schools I need some small fruit and vegetables crotched or knitted as we are teaching ‘small plate size’ to the children. so do you know anyone that could do this for mr5aday? Hi Pat that would be great. Any animal you lke, all are very welcome in the woods.